Note from Blog host — another example of East meets West through business and trade: Higher education is a business, and the number of international students at U.S. colleges and universities reached 723,277 during the 2010-11 academic year. China, the top country of origin for international students, sent 157,558 undergraduate and graduate students to America, up 23% from the previous year. International students and their dependents contributed more than $20 billion to the U.S. economy that academic year. For Chinese students, that means about $4.4 billion came from China. On October 1, 1949 the People’s Republic of China was formally established in a speech given by Mao Zedong from the Imperial Gate at Tiananmen Square. I stood at the very spot where Mao gave his speech and took a photo. From speaking with people – in China – who lived through his reign it was beyond believable. What he put his people through is an unforgivable act of power and brutality. 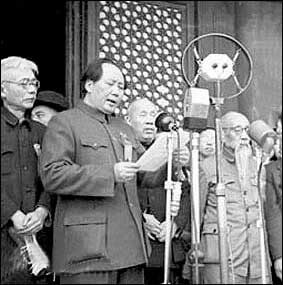 However, it is images from Mao’s era that some – outside of China – still have of the Chinese people. Nothing could be farther from the truth! I never met a Chinese government official – did not even see one at least that I can recall. What I did meet were the people of China – the people with whom I had my business and personal interactions. I did not ask them questions about their government nor did they ask questions of mine. The only political statement that I ever heard was a reference that China’s policy would probably change when the younger generation came into power, someday. In meetings, over two years ago, I heard about the oil pipeline being built directly from Iran to China. None of the people in that meeting expressed an opinion one way or the other regarding this pipeline. It was a decision the Chinese government made. Maybe my associates did not approve of dealing with Iran—maybe they did? The point being here is their government made this decision—not my associates. Whether the officials in power in the US are republican or democrat, they have all made decisions of which I don’t agree. They did not consult me or ask my opinion—am I my government in these situations? The point I am trying to make is that I found the Chinese people I met just like me in a lot of respects. I enjoyed doing business with them – learning their culture – and becoming their friend. No government – or its actions – is ever going to change that for me! In China, the power of legislation is not held by a single power organ or one particular person. China’s legislative power is carried out by two or more power organs, which means the country has multi-legislative powers, including at national level, that for administrative laws and local laws, each subject to different organ authority. However, unlike the United States, the structure of China’s government is not one of checks and balances, where the legislation, administration and court stand independently to restrain one another, but more like the democratic parliamentary system [seventy-seven countries such as the UK, Spain, Canada, Germany, Thailand, Japan, etc.] which also offers few effective checks and balances so China is not alone in this regard. The National People’s Congress and its Standing Committee make state laws; the State Council and its relevant departments draw specific regulations respectively; and relevant authentic organs of ordinary localities and governments formulate local regulations. China’s current legislation structure is deeply rooted in the specific conditions of the nation. First, China is a country where the people are their own masters, so laws should reflect their will [should does not mean the will of the majority automatically leads to new laws—that is what happens in a true democracy but not in a republic]. Then on December 31, 2011, in another post, I had this comment from Alessandro about China’s political system. He is an Italian married to a Chinese citizen, and they live in China. Are Chinese citizen entitled to vote? “Yes,” Alessandro said, “my wife and her family just did it less than a couple of months ago. “Was that how the communist party’s secretary Hu Jintao got his position? “Yes,” Alessandro said, “Hu Jintao was voted in by the people entitled to do that, the National People’s Congress (全国人民代表大会), which in turn has been elected by the people’s congresses of the lower level, and so on down to the lowest levels. Before you judge China, and answer the question, “Is China a Republic?” here are a few definitions of dictatorship. According to Webster’s Online Dictionary.org, a dictatorship is an autocratic form of government in which the government is ruled by a dictator. In contemporary usage, dictatorship refers to an autocratic form of absolute rule by leadership unrestricted by law, constitutions, or other social and political factors within the state. People’s democratic dictatorship [sounds like an oxymoron] is a phrase incorporated into the Constitution of the People’s Republic of China by Mao Zedong. The phrase is notable for being one of the few cases in which the term dictatorship is used in a non-pejorative manner, which means not in a negative, disparaging or belittling manner. By saying “People’s Democratic Dictatorship”, the CCP meant that the people rule. However, that would be incorrect since even in all three types of democracies, the people do not rule. The people elect those that rule—well, at least some or most are elected. Over at William Meyers.org, you may learn more about how the United States was born as a republic and over the course of one hundred and fifty years, step-by-step, became what Meyers calls a “true representative democracy”. Meyers says, “Democracy means rule of the people. The two most common forms of democracy are direct democracy and representative democracy. Representative democracies are, therefore, a kind of republic. Self-appointed governments such as monarchies, dictatorships, oligarchies, theocracies and juntas are not republics. However, this still allows for a wide spectrum. “The classic is the Roman Republic, in which only a tiny percentage of citizens, members of the nobility, were allowed to vote for the Senators, who made the laws and also acted as Rome’s supreme court. “Most people would say that Rome was a Republic, but not a democracy, since it was very close to being an oligarchy, rule by the few. Although the Roman Republic was not a dictatorship (until Augustus Caesar grabbed power), it did not allow for rule of the people. “But,” Meyers says, “the main Amendment that tipped the scales from the national government of the United States being a mere republic to being a true representative democracy was the often-overlooked Seventeenth Amendment, which took effect in 1913. Now, if you have read this far, you may answer the question — is China a Republic? It appears that democracies come in several types. According to Democracy Building.info, there are three basic types of democracy—the Direct Democracy [ex. Switzerland], the Presidential Democracy [ex. USA, France] and the Parliamentary Democracy [ex. UK, Germany, Spain, Italy]. As for checks and balances, the parliamentary system offers few effective checks and balances [remember that China doesn’t offer checks and balances either]. In the UK, the Prime Minister, as head of state, is not elected. He or she is the leader of the majority party and may stay in power as long as his or her party is the majority. One of the main criticisms of many parliamentary systems is that the head of government is in almost all cases not directly elected by the people. There are two types of parliamentary systems. One is the unicameral system, which means it only has one single house or parliament. Forty-four countries fit this description. Examples are Denmark, Finland, Greece, Israel, New Zealand, Norway, Portugal, Singapore, Sweden and Turkey. Then there is the bicameral system [thirty-three countries] of a parliamentary government, which has two houses, an upper and a lower chamber. Examples of this form of democracy are Australia, Austria, Belgium, Canada, the European Union, Germany, India, Ireland, Italy, Japan, South Africa, Spain, Thailand and the United Kingdom. Let’s see how China’s type of government compares and decide if it is a democracy, republic or a dictatorship. That means about 549.6 million rural Chinese vote in democratic village elections every three years. By contrast, in the 2010 US national election 37.8% (90.6 million) of the voting-age population turned out, and in 2008 only 56.8% (132.6 million) did. In 2008, the voting age population was 231.2 million and in 2010, it was almost 236 million. If the majority of people do not vote in an election, does that mean the democracy is broken? I recommend reading Rural Life in China at Facts and Details.com. It is well balanced and points out the way it was and the way it is. Although I did not read every word, I didn’t see any China bashing going on. It was not an indictment of China. However, I am sure a critic [read that enemy] of China could easily cherry pick this article and select a few pull quotes to support more misleading mudslinging at the CCP while ignoring what life was like in rural China before 1949. If Mr. Parfitt is nothing else, he is creative. It is true that at one time a strong case could be made that during Mao’s Cultural Revolution, China had one of the most repressive regimes in the world but that claim is questionable today and has been since the 1980s regardless of what some say happened in Tiananmen Square in 1989. To discover an answer to see if China is qualified to be called a republic instead of a dictatorship, I will provide information and let the reader decide. Then Albatrus.org says that in 1928, the US Army provided a more succinct definition of a republic: Authority is derived through the election by the people of public officials best fitted to represent them. Attitude toward property is respect for laws and individual rights, and a sensible economic procedure. Attitude toward law is the administration of justice in accord with fixed principles and established evidence, with a strict regard to consequences. A republic is the “standard form” of government throughout the world. Jeff Cole at PR 101 asked, “Why do people believe everything they read on the Internet?” Then Cole cites two examples in his PR 101 post to make a point. In both cases, what people read and believed without checking the sources led to a panic and may have caused children to suffer and die. If interested in more details, click on the link in the first paragraph to read Cole’s post. After learning how gullible people are when it comes to reading something on the Internet, it should come as no surprise that China’s only national Red Cross society is fighting to keep the public’s trust after a scandal erupted when Guo Meimei, a 20-year-old woman, claimed on a Blog to have a link to China’s national Red Cross. After bragging, Guo Meimei became a hot topic on China’s major micro blog website, Weibo.com. Her fans jumped from a few hundred to more than 108,000 within a short period. Five days later, Shanghaiist.com reported that Guo was stopped at a Beijing airport from leaving China to visit Australia with her mother. Shanghaiist‘s Robert O’Connor wrote, “Guo continued to deny connections to the Red Cross Society and asked reporters and internet users to “stop fooling around”. When was the last time you believed something you read on the Internet without checking to see if it were true or not? A good place to start might be Snopes.com.